For a first-time pet owner, animal adoption can be a daunting experience. New routines, new supplies, and a whole new lifestyle often come with a pet, and for someone like Aidan B., it can be a big adjustment. Fortunately, this first-time dog-dad had two things going for him: a girlfriend who grew up with dogs, and a new three-legged companion to show him just how fantastic pets can be. 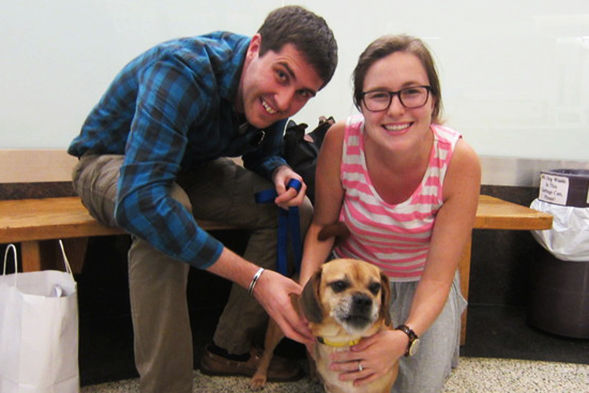 Here is the Happy Tail of Aidan, Julie, and a beagle named Finch. Julie S. grew up with dogs and couldn’t wait to adopt one of her own. Her boyfriend, Aidan, wasn’t so sure. Many of Aidan’s relatives have pet allergies, so he hadn’t spent much time around dogs as a kid. Because he was hesitant to jump into adoption, the couple came up with a perfect solution: dog fostering. In August, they signed up for the ASPCA Foster Care Program, and Julie began looking for the perfect first dog to ease Aidan in to the pet-parenting lifestyle. That’s when she found Finch. 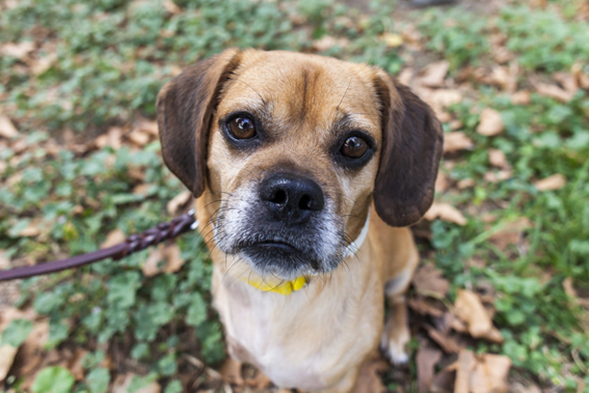 A seven-year-old beagle mix, Finch first came to the ASPCA in June. He was rescued from an abusive situation by the NYPD, and he arrived at the ASPCA Animal Hospital with an injured leg that needed to be amputated. Doctors at the hospital performed the surgery and Finch spent the next couple of months recovering in our care. In August—around the same time Julie and Aidan joined our foster program—Finch was ready to move in to a new home. At the ASPCA Adoption Center, Julie and Aidan learned more about sweet Finch. Despite his injuries and difficult past, Finch was loving, playful, and curious—and perfect for the couple. “Finch is pretty adorable and I think anyone who saw his picture would want to adopt him,” says Julie. “But on a more practical note, it was really important to us that he could socialize with people and children. Also, we wanted an older dog.” Finch fit the bill, and—contrary to all plans—Julie and Aidan skipped the foster phase and adopted him that very same day. “It was just a feeling I got when I saw a picture of him, and then a feeling we both got when we met him,” she says.